Paul Pollock's hopes of competing at the Olympics have been dealt a major blow after a foot injury forced him to pull out of Sunday's London Marathon. Pollock, 29, is currently the fourth fastest of the Irish male qualifiers for the marathon in Rio but each country can only send three athletes. The Holywood man must now hope that his superb World Half Marathon run last month will sway the Irish selectors. Pollock was 14th in Cardiff with Mo Farah the only European ahead of him. "I didn't want to have to depend on the selectors but the stress-response injury I have means if I did attempt to run in London after getting an injection, it would be virtually 100% certain I would have a fracture afterwards which would put me out for at least eight to 10 weeks," Pollock told BBC Sport Northern Ireland. "That just wasn't a sensible option so I have had to pull out of London and hope that the selectors look at the World Half Marathon where I finished over two minutes ahead of all the other Irish Olympic hopefuls and my other recent performances." Pollock also finished ahead of Ireland's current leading marathon qualifier Kevin Seaward at the Wokingham Half Marathon and another 10K race in recent months. "If the Irish selectors are picking the strongest team for the Olympic marathon, I would like to think I would be one of the three athletes that they will select." Pollock had been hoping to improve on his personal best of 2:15.38 set in Berlin last September. Sergiu Ciobanu is currently the third fastest Irishman with 2:15.17. Pollock's regular training partner, Belfast runner Seaward is the fastest of the Irish qualifiers having run 2:14.52 in Berlin while Mick Clohisey clocked 2:15.10 in Seville two months ago. 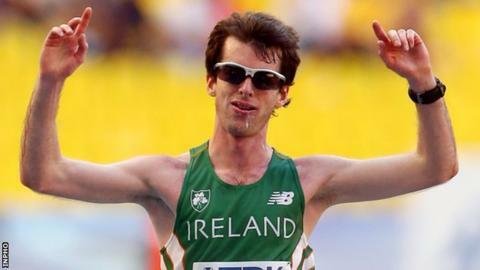 Athletics Ireland are scheduled to pick their marathon selections on 23 May when the qualifying deadline expires. Pollock felt the injury when he attempted to train five days after his impressive run in Cardiff where he clocked a time of 62 minutes and 46 seconds in wet and windy conditions. An MRI scan revealed a "stress response" and after Pollock mulled over the issue for the past fortnight, he was forced to accept the inevitable on Sunday and pull out of this weekend's London event. Pollock will hope that rest and treatment over the next few weeks will enable the injury to recover and enable him to maintain his ambitions of competing in both the European Championship 10,000m and Olympic marathon. Glengormley runner Thomas Frazer, among the eight Irishman to achieve the Rio standard after clocking 2:17.45 in Rotterdam last April, will compete in London this weekend along with another Northern Ireland man Stephen Scullion and Rathfarnham's Sean Hehir.